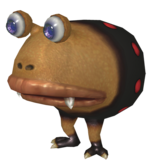 The grub-dog family contains true Bulborbs, as well as several other species in the Pikmin games. The most well-known member of this family is the Red Bulborb (or Spotty Bulborb in Pikmin). Bulborbs, Bulbears, Bulblaxes, and Bulbeels are all part of the Oculus genus. All true Bulborbs with known scientific names are in the kageyamii species, and all Bulbears are in the terribilis species. There are still different subspecies for the creatures, unlike Bulblaxes and Bulbeels. Water Dumples and Long Water Dumples are part of the Ichthyosa genus, as they are much different than the creatures listed previously. In the games, it was previously believed that Dwarf Bulborbs were immature Bulborbs, but it was later discovered that they are a species of their own and actually belong to the breadbug family. 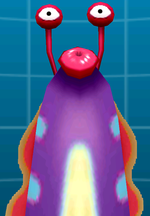 In Pikmin, the spots on the backs of grub-dogs pulsate in size, even when the game is paused, but since Dwarf Bulborbs belong to the breadbug family, they do not have this characteristic. Further, the spots on Red Bulborbs oscillate in size slower than the spots on the other two grub-dog types. In Pikmin 2 and Pikmin 3, these never change size. Bulborb Larvae are only seen in Pikmin 2. These newly-born Bulborbs are without legs and do not yet have the unique color patterns that the adults display. These tiny creatures have exceptionally low vitality, but are capable of eating Pikmin with incredible speed. These small enemies are continuously born from some Empress Bulblaxes. Like the Spotty Bulbear, the Dwarf Bulbear appears in all three Pikmin games. They resemble miniature Spotty Bulbears, but unlike Dwarf Bulborbs, are actually juvenile Bulbears. Bulbears in particular are known for hunting along set patrol routes in search for prey, but these immature grub-dogs do not yet have established routes, and thus rely on their parent to guide them towards food. When by themselves, Dwarf Bulbears will behave just like Dwarf Bulborbs, but if an adult Bulbear happens to stroll by, these eager young creatures will bark and immediately fall into line behind the beast. The Emperor Bulblax is the final boss in the first Pikmin game. This beast resembles a flabby yellow Bulborb with small red eyes and a large, moss-covered backside. 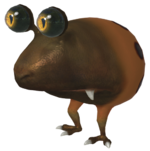 Its attacks include licking the ground with its tongue (with the intent to eat any Pikmin that happen to be there), licking its face (to get rid of offending Pikmin), and jumping high into the air to crush and shake off Pikmin. The safest strategy by far is to have yellow Pikmin grab nearby bomb-rocks and have the Bulblax ingest them. The Emperor Bulblax appears again in Pikmin 2, though this time is much smaller, much weaker, and much more common, appearing in multiple caves, sometimes twice in the same sublevel. Although it still possesses its signature rock-hard hide, it is significantly less mossy. The Empress Bulblax is a boss-class enemy in Pikmin 2. It resembles a cross between a Red Bulborb and a gargantuan termite queen. The Empress Bulblax seems to be vulnerable on all parts of its body, but attacking the head is easily the safest way to go about it. After a while, it will shake off any hostile Pikmin and roll left and right, crushing anything underneath and sometimes causing boulders to fall from the ceiling. Later dungeons have the Empress continuously giving birth to ravenous Bulborb Larvae before and during the battle. The Eye-Stalker Bulbeel is an aquatic variant of Bulborbs that appears in Hey! Pikmin. It strongly resembles a purple eel with red fins, light blue stripes on its sides, and a tan belly. Its mouth appears small and puckered when not attacking. They are found emerging from underwater pits. Eye-Stalker Bulbeels attack by lunging directly upwards with their mouth wide open to eat Pikmin, after which they will retreat. They poke their heads out before attacking, giving Olimar a chance to get away. They have high health, and while defeating them is time-consuming, it rewards the player by dropping lots of Sparklium. 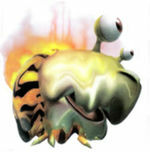 The Fiery Bulblax is found only in Pikmin 2, and is a rather odd-looking creature. Its entire body has a melted appearance, and one of its eyes is smaller than the other, possibly an eye tic. This mean-looking creature's skin secretes chemicals which combust upon exposure to oxygen, setting its body aflame. Only Red Pikmin can withstand the blaze this creature's body produces. However, if lured into water, the flames can be extinguished, making it a prime target for Blue Pikmin. Hairy Bulborbs are enemies exclusive to Pikmin 2. A Bulborb variant which shares many traits with the Red Bulborb, Hairy Bulborbs are mostly white, with a brown nose and blue spots. The most notable characteristic of this particular subspecies is a plume of fluffy white hair on the creature's back, which insulates its body as an adaption to a colder habitat, and it falls off in battle. Hairy Bulborbs behave similarly to Red Bulborbs, but are slightly more aggressive and more resilient to attack. They can still be overpowered with a large army of Pikmin. Main article: Long Water Dumple. The Long Water Dumple is the boss of sector 2 in Hey! Pikmin. It is an elongated, eel-like variant of the Water Dumple, with bright yellow spots, a pink mouth lined with sharp teeth, and hair-like follicles on its head. They have two eye-stalks with glowing orbs on the end that act as its eyes, similar to Bulborbs. It attacks by quickly lunging at Olimar from the side of the screen, eating any Pikmin in its way, after which it is vulnerable for attack. In-between these attacks, it can be seen swimming in the background. It can also attack by ramming into a wall in the background which causes large chunks of rock to fall, or it can spit round rocks at Olimar. It drops the Unexamined Nest after being defeated. The Orange Bulborb is an enemy in Pikmin 2 and Pikmin 3. Its appearance closely resembles that of other Bulborbs, but this particular variant sports an orange rump with black spots and a black face. Its yellow, bloodshot eyes are an indicator of this dangerous creature's vicious temperament. As with other Bulborbs, this animal is usually found snoozing. It does not have any particular resistances or special attacks, and can't stuff any more Pikmin into its mouth than its relatives, but should still be approached with caution: Orange Bulborbs are especially easy to wake from a nap, and can often be extremely difficult to defeat without losing any Pikmin, even when using traditional Bulborb-fighting tactics. 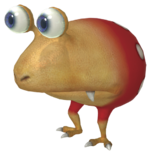 The Red Bulborb is arguably the most famous enemy in all Pikmin games, and is often just as much a staple for the games as the Pikmin themselves. The Red Bulborb was originally known as the "Spotty Bulborb", but as other Bulborb variations were discovered, all with spots, it was renamed. Red Bulborbs, like most Bulborbs, are largely nocturnal creatures and prefer to spend the daytime sleeping. They have a slow reaction time and can be overwhelmed by a large enough force, but caution should always be taken, as these gluttonous predators can swallow several Pikmin at once. Attacking from behind will usually yield the best results, though the safest method is often just to toss heavy Purple Pikmin onto its back. Spotty Bulbears are creatures in all three Pikmin games which resemble Bulborbs in appearance, but are not identical. They are a bit shorter, with rounded snouts, large chapped lips, and a wide mouth which allows them to gobble up many more Pikmin. From a distance, they are easily distinguishable by their tan faces and black bodies with red spots. Often, a Spotty Bulbear is followed by a group of Dwarf Bulbears. These beasts sleep most of the time in Pikmin, but still pose a realistic threat, as they are a good deal tougher than Spotty Bulborbs. 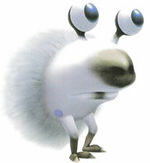 In Pikmin 2, they are wide-awake during daytime hours, making them all the more dangerous. Water Dumples are enemies in all three Pikmin games. They are part of the grub-dog family, despite having different appearances for aquatic habitation, and also having similar eating habits. They are most commonly found in the water, but can survive on the land as well. They resemble blue shellfish with relatively large mouths. Water Dumples are defeated somewhat easily as long as the player takes caution and swarms them. 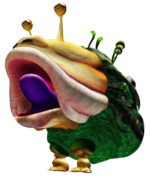 The Whiptongue Bulborb is a creature exclusive to Pikmin 3. They feature the characteristic rounded body and bulbous stalk-eyes, but they are different from their many terrestrial cousins in that they have a long, anteater-like snout instead of a large maw. It lashes its tongue out violently to ensnare Pikmin, then pulls them in and does a very brief animation of licking its chops and swallowing. The long tongue effectively gives the creature a ranged attack, which can make it a difficult foe to defeat. The following enemies exist in Pikmin Adventure, and are said in-game to belong to the grub-dog family. They are, however, not canon. The Bulblord is a boss that appears only in Pikmin Adventure. It is a huge mechanical enemy that can charge towards the player and their Pikmin and also crush them by rolling over. It looks very similar to the Red Bulborb, except with various pink orbs around it that serve as weak points. The Grand Bulblord is a boss found only in Pikmin Adventure. It is very similar to the Bulblord, also being a large robotic creature with pink orbs around it. However, it is green and has more menacing yellow eyes. It also attacks significantly faster, and can even spawn enemies like the much smaller Red Bulborbs found in the game. "Grub-dog" is a combination of grub, a worm insect, and dog, because of their snouts and Captain Olimar's dog, Bulbie, resembles a Bulborb. Moreover, Bulborb is derived from Bulbie. However, a Hocotatian dog looks very different from an Earth dog. Most members of this family have the word "Bulborb" in their name, which is likely a combination of "bulb" and "orb", referring to their large, round eyes and bulbous body. The Japanese popular name for "Bulborb" is チャッピー? (lit. : "Chappy") and the Japanese name is デメマダラ? which, according to the Super Smash Bros. Brawl trophy for the Red Bulborb translates to "Spotted Bug-eye". 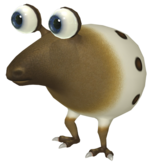 The genus names of most Bulborbs is Oculus, which is Latin for "eye", and the species name of most of them is kageyamii, which is most likely taken from Daisuke Kageyama, one of the developers credited for creature design. “A creature whose Japanese name translates as "spotted crimson bug-eye." These bulky nocturnal animals have white-and-red-flecked rumps that resemble strawberries. Red bulborbs sleep in the day and wake in the evening to feed on small animals. Several colors of bulborb subspecies have been discovered—their classification is a hot subject for scholars. This page was last edited on March 1, 2019, at 08:54.